This is what my darling girl looks like after a hard day at Pre-K. I spend 15 minutes on her hair every morning - taming those curls into cute ponies, piggies, and twists. And she takes them down by lunch EVERY stinkin' day. She's a mess, but she's mine and I can't imagine life without her! This card gets to serve double duty and meet the requirements for two challenges this week. The first is the color challenge from Courtney. 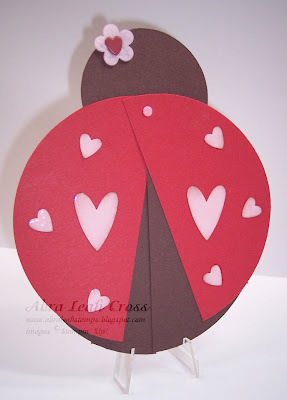 The card had to have Chocolate Chip, Pink Passion, and Real Red. I stink because I adore Courtney and this is the FIRST time I've done one of her challenges. Sorry, darling!!! You know I love you! I used my Big Shot a LOT on this card!! I cut just the "Love" sentiment from the SU! 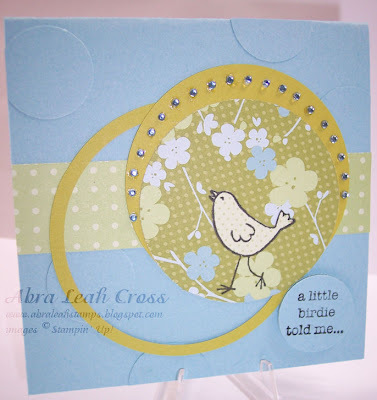 strip die "Join in the Cheer" and coated it with Crystal Effects to make it look like a plastic embellishment. Same thing for the little heart. This card also brings me to the end of a wild week of sketches! It's the 9th and final sketch in Taylor's Anniversary Challenge. 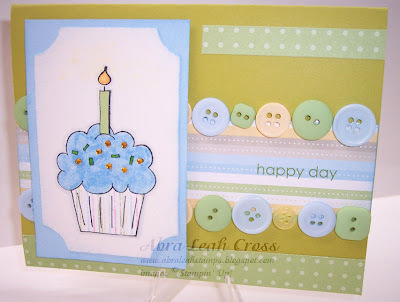 Appropriately, I'm ending a Cupcake Mega Challenge with a cupcake card! The sketch was created by Vicki, another blogger I'd never visited before. 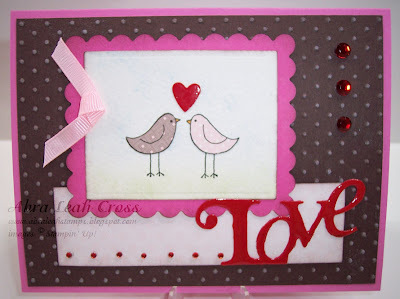 She has some adorable ideas on her blog - her scrap layouts are stunning. I'll definitely be adding her to my blogroll. A couple of years ago when I ran my first stamp club there were several women who I had met through my sister. I didn't really know them very well, but they were so excited about stamping and scrapbooking. We all sat around a table for their first club meeting and everyone was oohing and ahhing over each other's pictures. I had set out all of my supplies, did a quick demo, and then let them loose. I was working on something, and I realized they were all still looking at pictures. I asked how long they had been scrapbooking and they said, "Oh, about 45 minutes!" I didn't realize they had never scrapped before! They've come a LONG way since then!!! I got a real car today in exchange for the teeny one they gave me on Monday. I'm now riding in an '09 Trailblazer and, boy, it is a HUGE difference. In the first car Bradley kept rolling down the windows. I couldn't use the window lock feature because it had MANUAL windows - the kind what has a rolling handle thing. Ack!!! I had to wait over an hour for the new car because the first one they were going to give me (a minivan) didn't start! And let me tell you, if I had gotten that bad boy home tonight only to have it be dead in the morning... I might have a tad bit unpleasant and not quite lady-like. This weekend I ordered some of Taylor's Tiny Twinkles and they actually arrived today - that is wicked good shipping, Taylor!!! I, of course, had to use them right away - and what better way than on one of the challenge sketches! This sketch is by Stephanie Hargis and I thought it would work well for the use of these itty-bitty sparkles. I had never used them before and so I couldn't believe how tiny they really are. On Taylor's blog she suggests using them with Crystal Effects, so that is exactly what I did. 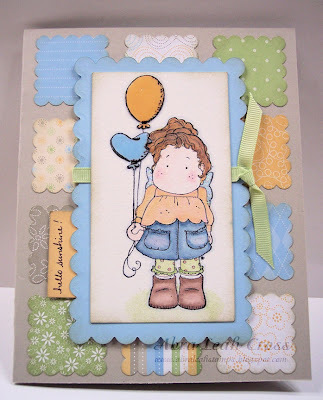 This is more of the new Sale-a-bration Designer Paper by SU! I like this color combo (Sahara Sand, Bashful Blue, Certainly Celery, and So Saffron) and I don't think I have ever used it before I got this paper. What a day! (As if my weekend wasn't enough!) I had to be at the body shop first thing this morning and I left them my 3-row, 8-passenger Ford Explorer and got a flippin' Chevy Cobalt. Huh? I can't even fit both of my car seats in the back of the coupe... I called the insurance and the woman was a doll and she is going to upgrade me so that I can get a real car tomorrow or Wednesday. Because *my* car won't be ready until MAYBE Friday, but more likely Monday. Ack!! I actually did manage to get some more stamping done this weekend, event amongst the plague-ridden in my household. I lost track of how many loads of laundry I did, and this next card was completed over several hours when I would take a few minutes to breathe clean air! For a while Bradley amused himself playing on PBSkids.org on my computer and I got some quality time on the other side of the craft room. I don't know if I'm going to make this 9-sketch goal, but I'm still going to try! 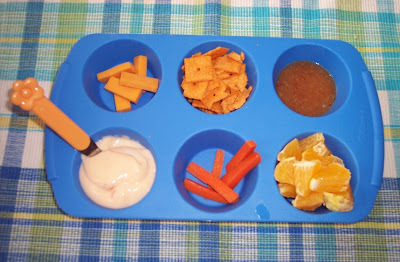 It's 8pm and Bradley has been down for about 45 minutes, Chloe just nibbled on a couple of crackers without any adverse side effects, so I'm going to dash to the store to get some supplies for her for tomorrow. I *think* Mike can manage for an hour, right? Let's hope so!!! Thank goodness my mom is close and can stay with her tomorrow!! I keep spraying that air sanitizer stuff, but I think we have tough cooties. I used them to make Bradley's 3rd birthday party invitations. And I stamp the images for Bradley to color all the time. 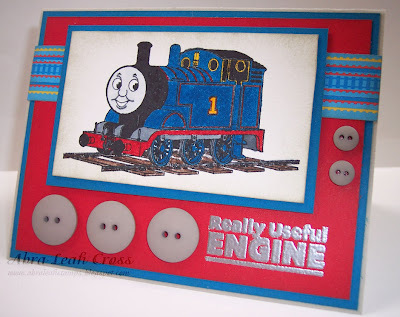 I hope they come out with more - we could really use a Percy stamp. But, I digress... There is a BIG challenge going on over there - a 9-sketch challenge to be exact. I'm actually going to try to complete all 9. I had some free time today, which was great, but not for such a good reason. Now that Bradley's feeling better, Mike has taken the horrible spill into Vomitopia. I kept the kids away from him - and we spent some quality time in my craft room! The kids colored and I stamped! It's not often that I get a break and am able to join a good challenge! I'm going to try to do more of these, because they really are fun. In fact, I gave this post a new label - Challenges. This is the first one, though. Since I have a label, now I'll be forced to do more entries because I just can't stand labels with only a couple of things in them! I've been meaning to do Courtney's (I even have a blinkie for it!) - but time, gah! Anyway, this is for the Taylored Expressions Cupcake Challenge - a weekly sketch challenge that doesn't HAVE to include cupcakes, but if you have 'em, why not? 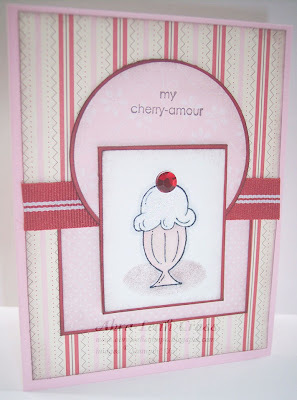 Not only is it a holiday Monday and I don't have to go to work, but it's also the first day of the new Stampin' Up! 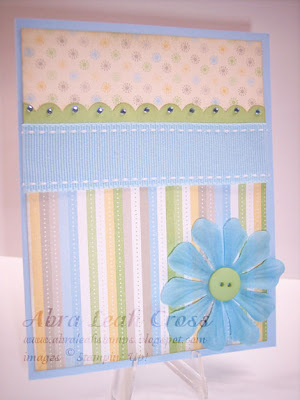 Spring~Summer 2009 Idea Book and Catalog! That's right, folks, you can finally get your inky fingers on all the fabulous new stamps and accessories. To celebrate, here's a sample using what might be my most favorite hostess set ever. I wish you could see it in person because this card really sparkles! We'll be using this set at my upcoming Catalog Kick-off Party - check out my SU! 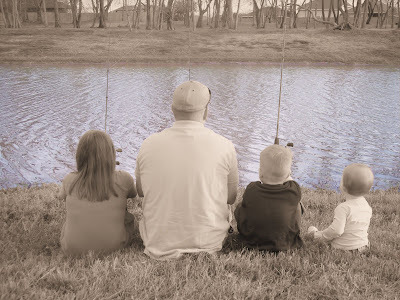 website for all the details. This weekend it hovered over our stairs and Bradley decided he needed it. Now. Please, mama, please. I asked how we should get it... he said, "Get the ladder!" Now, I'm pretty brave, but not brave enough to balance the ladder on the stairs. 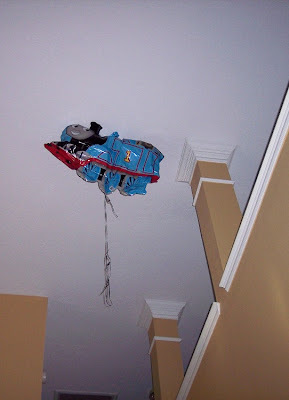 So, we just let it float... Half hoping it would make its way to the game room upstairs, and half hoping it would just sink and be done with its mocking ways. "You know what? When I walk around with my eyes closed, I seem to bump into things more often." So, my UPS man (who I love and adore) (and also, he has a great pair of legs), just dropped off my box of NEW Spring-Summer 2009 SU! catalogs! I was NOT expecting them because usually I get my free demo copy in the mail a few days before I get my pre-order. What a fun surprise!!! :) Call or email if you need one!! This evening I attended the first class of my graduate school career. I was a bit nervous, and grabbed a spiral, pen, and sticky pad on my way out the door from work. (I didn't get my Lisa Frank Trapper Keeper with matching stickers and pen that has 4 inks in one.) After some introductions I was called to the board and asked to do a math problem. Me. Who hates math. Who for realio trulio has math anxiety. I had to do a math problem on the white board in front of the whole class, my professor, and Jesus. And then I died. I did regain consciousness and thoroughly enjoyed the instructor, the conversation, and the rest of the class. I know it will be an amazing learning experience and an exciting way to begin grad school. Plus the professor told us we will all get A's. When I'm done with grad school I'm totally going to Disney World. Here's another little Valentine. I paper pieced the hearts and the leaves. 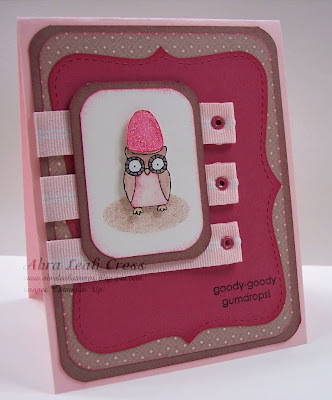 The sweet little Owl was stamped with Staz On on watercolor paper and then colored with markers, ink, and a blender pen. Mike said he looks like he has chest hair. Hmm.... I think next time I'll leave out the squiggles on his front!!! Now all I can see is chest hair. 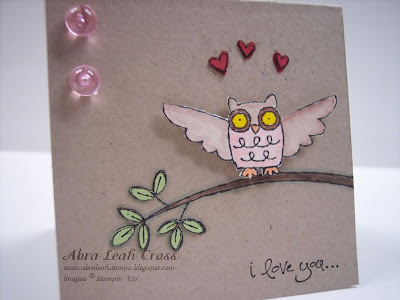 Well, he's a manly owl - he's not scared to admit his love...or wear pink! The inside says "...This much!" I really enjoy making little Valentine cards for people... so I'm sure you'll see more in the next few weeks!! 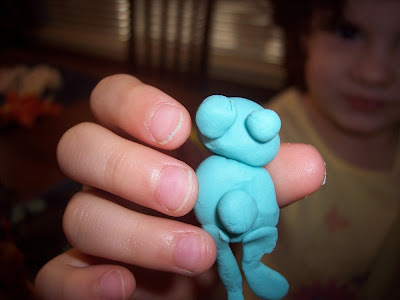 And Bradley made "A pile of play doh!" He's my realist.